The Index, which aims to reflect market sentiment and is a key indicator of exchanges performance closed at 50,664.59 on 30 April 2018. "As some exchanges see volumes decelerate from strong January and February levels, the share prices of over half of the constituents of the index were in decline in April. The numbers this month make surprising reading in terms of leaders and laggards. While not quite being a case of 'the first will be last and the last will be first', Multi Commodity Exchange of India this month went from the back of the grid, all the way to the front, as the exchange registered a 55 per cent increase in its March quarter net profit." 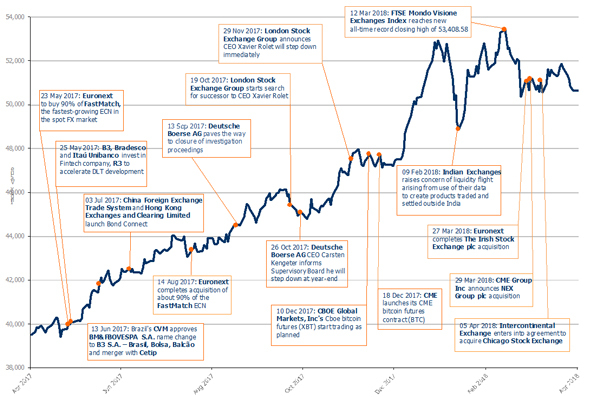 The FTSE Mondo Visione Exchanges Index best performer by capital returns in US dollars was the Multi Commodity Exchange of India with a 14.1 per cent increase in share price from 30 March 2018 to 30 April 2018. The next best performer was Hellenic Exchanges with a 9.9 per cent increase over the same period. The FTSE Mondo Visione Exchanges Index worst performer by capital returns in US dollars was Brazil's B3 with a 9.7 per cent decrease in share price from 30 March 2018 to 30 April 2018. This was followed by Philippine Stock Exchange with a 6.7 per cent decline over the same period. Click here to download April's performance report.